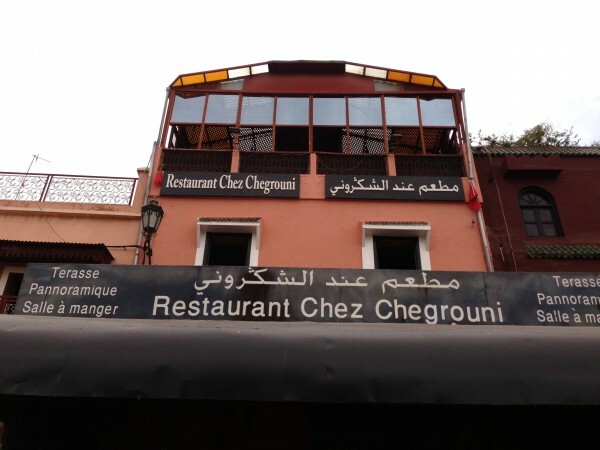 Don’t get it wrong – Chez Chegrouni is not just another restaurant coasting on the laurels of the popular UNESCO ordained cultural heritage site, Jemaa El Fna. 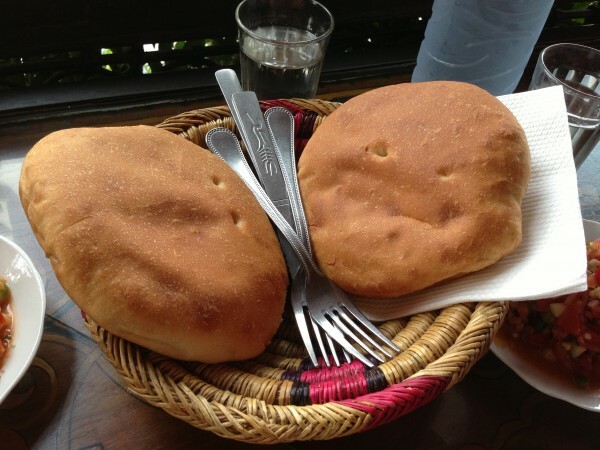 In fact, it is one of the most visited restaurants in the square, and for good reason too. Serving simple Moroccan fare for very reasonable prices, the restaurant boasts sprawling panoramic views from a terrasse upstairs as well as ground level views on a smaller patio at the front of the restaurant. There is a no reservation policy in effect so as a result, you will most likely see a line outside the restaurant and believe me, people wait. According to Conde Nast Traveller, even Michelin star chefs wait their turn, which says something. 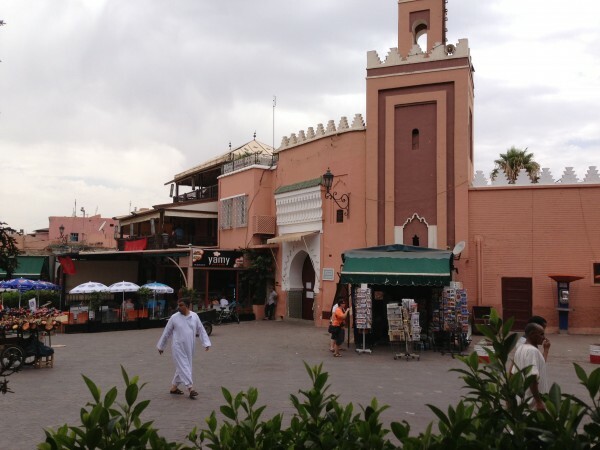 We visited Chez Chegrouni a couple of times over our stay in Marrakech. It’s an easy, fuss-free meal that’s guaranteed to be pretty delicious. The first time around, we were lucky enough to be seated right away at the bar overlooking the square at ground level. We watched as people entered the mosque across the street for their daily prayers. We gazed at motorists scootering past us and the slow passing of horse drawn caleches, owners hoping to entice tourists for a little ride. Between people watching and browsing the menu, we wrote our order down on a scrap piece of paper and handed it to our server. See? Easy. 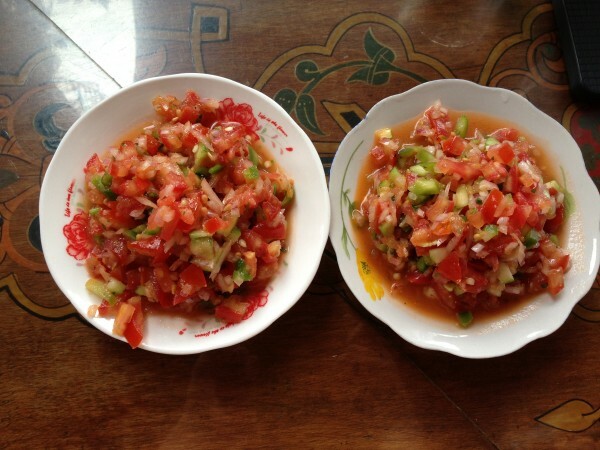 We both began with the Moroccan salad of tomatoes, cucumbers, onions and a bit of lemon. A heaping bowl of cool veggies was a welcome refreshment to the unbearable heat outside. 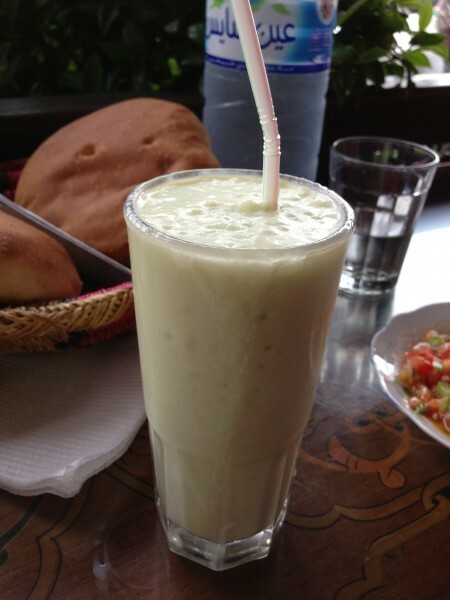 As was the avocado smoothie which was rich, creamy and particularly cold. 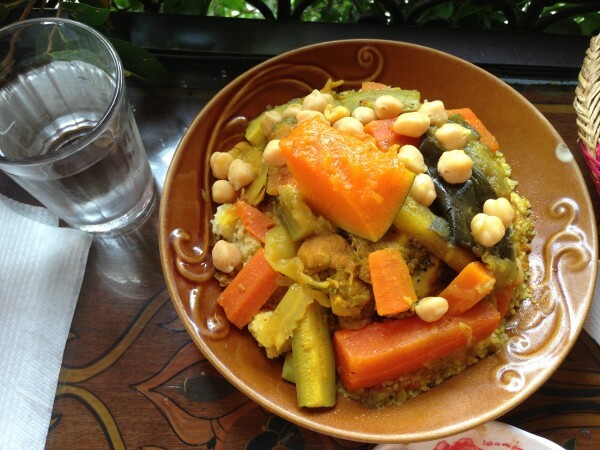 We opted for chicken couscous with a melange of squash, zucchini, carrots and chickpeas. Served steaming, straight from the oven, the veggies and protein sat comfortably on top of a mini mountain of couscous, juices and sauce seeping in from the top down ensuring the flavours even got into the centre most area of the dish. 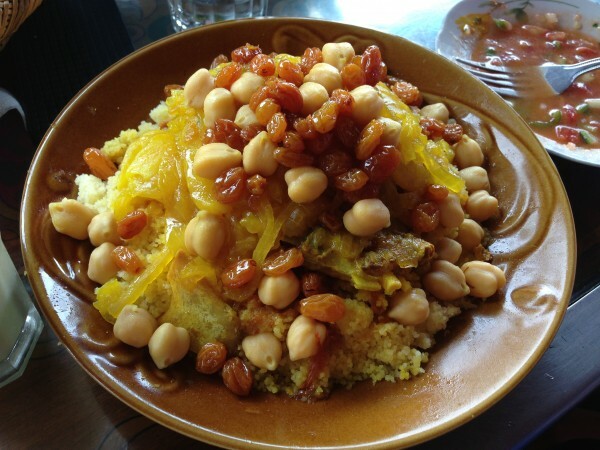 The beef couscous was a very different dish altogether – served with caramelized onions, chick peas and an abundance of golden raisins, the overarching flavours were sweet and simple and very delicious. This was probably one of my favourite dishes of all the ones we tried here. The yogurt was a must according to all the reviews and comments we had read prior to visiting Chez Chegrouni so of course, we had to make an order. When people of the internet speak in volumes, they’re usually not too far off. 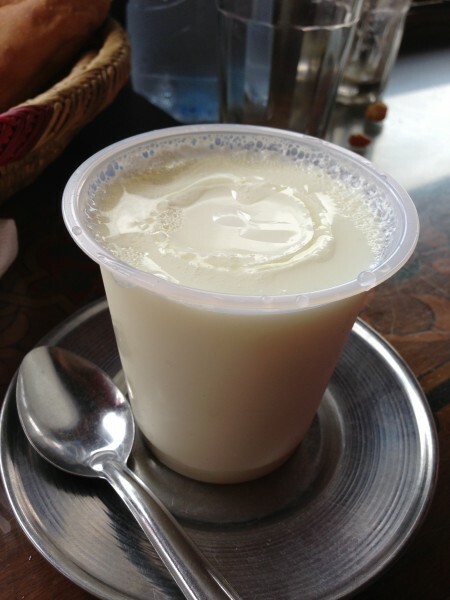 Sweet and light, the yogurt had a great consistency just between supple and soft. Great way to end our first meal here. We came back a couple nights later for dinner. As you can see, the views from the upstairs seating area are spectacular. We spent more than half our meal looking out across the square watching people hustle, sell food and drinks, haggle animatedly, charm snakes and kneel in prayer. A beautiful spectacle. 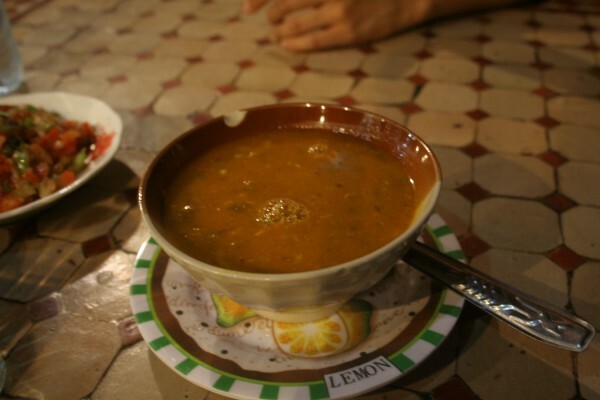 We tried the harira soup, a Moroccan classic that every restaurant seems to have some version of. The one served here is heavier on the tomatoes and lemon. Works for me. 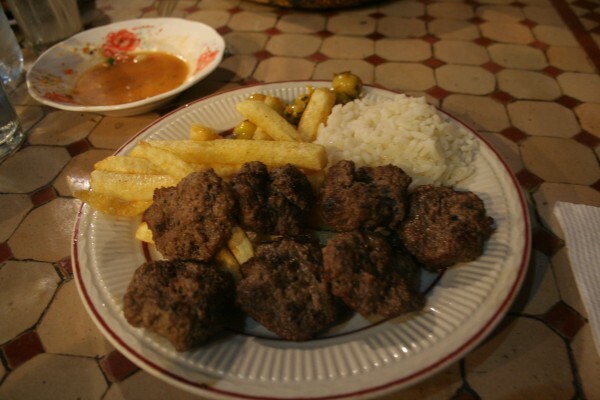 The kefta was the most disappointing dish of the evening. The meat was dry and tasteless, difficult to swallow without a good swipe of ketchup or some kind of sauce. The fries were also in need of some salt. 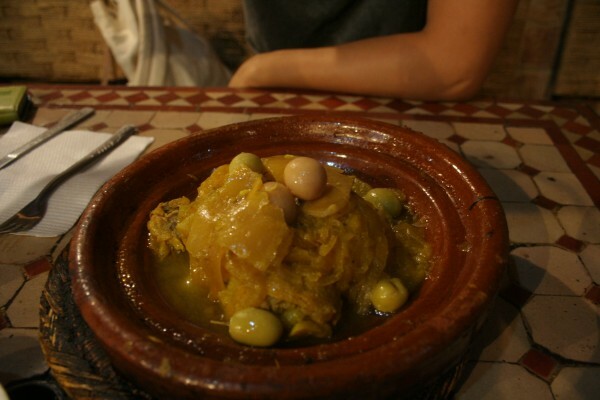 The chicken tagine saved the day – the meat was juicy and well cooked. Preserved lemons dominated the dish along with a handful of olives for taste. Remember the name Chez Chegrouni. You’ll want to check it out next time you’re in Marrakech for some very affordable classic Moroccan cuisine along with a beautiful view. 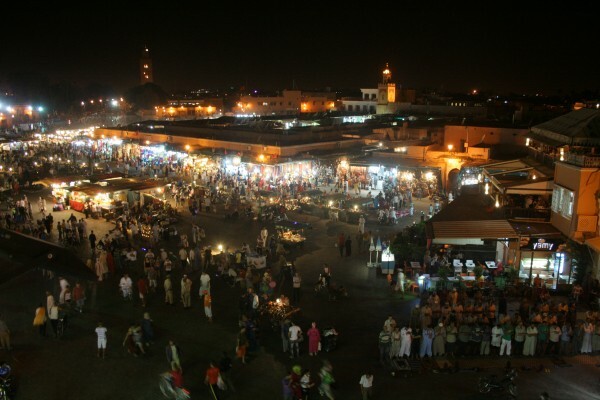 Tags: Chez Chegrouni, Dinner, Jemaa El Fna, Lunch, Marrakech, Morocco, Souk, Tagine, Terrasse.